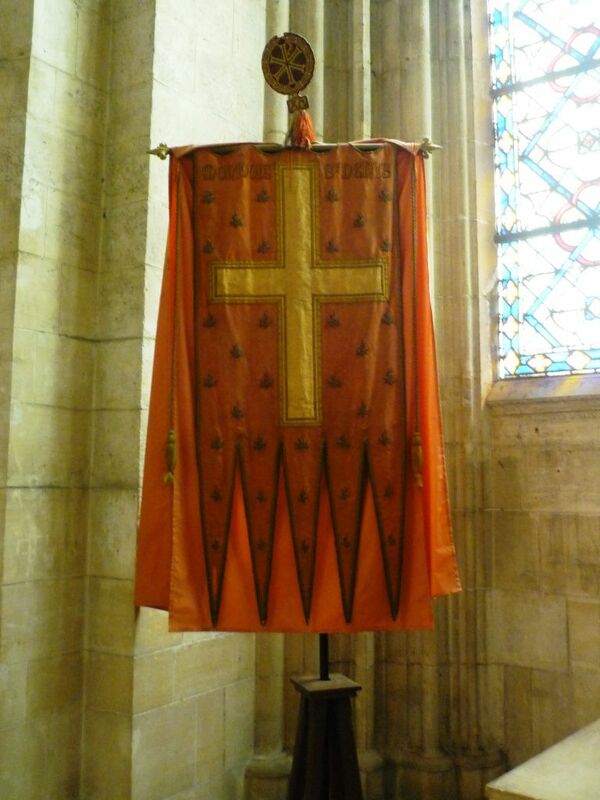 The oriflamme was a sacred banner used by the kings of France in the Middle Ages in times of great danger. It was distinct from the heraldic banner of the French kings (semis of fleurs-de-lis on azure, as expected). Its history is fairly continuous from 1124 onward, when it was first mentioned. It was first described in 1225. It consists of two parts: a gilded lance, to which is attached a silk banner, red with green fringes. The floating end of the banner splits into two or more trailing strips. The name, aurea flamma, conflates the banner (flamma) and the colour of the lance. The banner is sometimes represented as attached vertically to the lance, and sometimes (especially in the 19th century) as attached to a horizontal bar, itself suspended from the lance (modern rendition, St. Denis Basilica). The oriflamme was deposited in the abbey of Saint-Denis, north of Paris, where kings of France were buried, next to the relics of Denis who evangelised the area. When going to war, the French king would come to Saint-Denis to "raise the banner". The oriflamme is depicted on miniatures representing the battles of Crécy (image) and Poitiers (image). The last time it was raised was in the late 15th century, during the conflict between Louis XI and the League of Public Weal in 1465, as represented on a miniature (image). The banner was destroyed during the Revolution. What was its origin? The 1124 text mentions an old tradition of the counts of Vexin, who were protectors of the abbey; the kings of France had become counts of Vexin in 1077. But the text also alludes to a tradition specific to the kings of France. Also, a late 11th-century text, the Gesta of Roland, calls Charlemagne's emblem or banner orie flambe, but does not describe it. A description of the siege of Paris by the Normans in 885 mentions a large saffron-coloured banner with large indentations carried by a double lance. One author tries to link the oriflamme to Charlemagne's lance and through it all the way back to Constantine's labarum, which was taken from a pagan sanctuary located near modern Saint-Denis. (Constantine's lance was part of the regalia of the German emperors, and is now in Vienna). The idea is that the sacred object was the lance itself, decorated with a silk fanion, but later the meaning of the lance was lost and the silk fanion itself came to be seen as the important object. In Fleur de lis et oriflamme : signes célestes du royaume de France (Presses du CNRS, 2015 [first published in 1991]), the historian Anne Lombard-Jourdan (1909-2010; biography) seeked to demonstrate that both the fleur-de-lis and the oriflamme had the same origin. Relying heavily on textual and linguistic analysis, she considered them to be very old Indo-European symbols that survived during centuries through a sanctuary in Gaul. The sanctuary of the Lendit plain, north of Paris, was visited twice by the Roman emperor Constantine the Great in the 4th century. At his second visit, he was given a copy of a relic that was later seen as having given him victory. This relic, the labarum, was described as a big lance with a double-weapon called clava or rumphaea (probably some ranged weapon) set in its head, and was believed to be able to throw fire or fly on its own will. According to Lombard-Jourdan, the labarum survived in Gaul and was the oriflamme already used by Charlemagne. Most authors think this word means something like "golden flame", as the oriflamme was later a red flag, but the author thinks it was old French for aura flans or "slight breeze", wind being then considered as the will / speach of God. It was then firmly planted into the ground to be seen by everyone, hence the name standard. A poem later describes how two lances displayed a saffron gonfanon during the siege of Paris by Norsemen in 885. At an unknown date, the lance and the clava became separated. The oriflamme appeared again in Saint-Denis abbey as a lance with a red gonfanon, which the king of France Louis VI took and used to repel an imperial invasion. As for the clava, for many centuries we lose track of it, but according to the author, it simply became a relic called the holy nail (because nail is said lavus in Latin, it was easy to move from clava to clavus). It was also kept at Saint-Denis, and was very precisely described after an accident in 1233. This description allows the author to show it shared the very same appearance of the German emperors' own lance. That lance was in fact the original copy of Constantine, kept safe after many centuries and which is now in a museum in Vienna. This lance of Constantine was also copied several times during the Middle Ages, giving birth to other relics, one being also kept in Krakow, Poland. Several flag books (for instance, Inglefield's Flags [ing 79]) depict the uriflamme of Charlemagne, as an elongated, bright orange-red gonfanon, with orange-red flowers bordered in blue and the center yellow. This oriflamme was allegedly presented by Pope Leo III to Charlemagne; the only visual evidence of the event is a 9th century mosaic in Rome (photo). The real banner was probably a much more elongated gonfalon style. The number and design of the flower motifs must be conjectural, but semé would be more probable.